Near Dark was made in 1987 and reunited Bill Paxton with his Aliens co-stars Lance Henriksen and Jeanette Goldstein, as part of a family of modern-day vampires. Farm boy Adrian Pasdar finds himself mixed up with them as they travel across America, and the whole thing is perfectly directed by Kathryn Bigelow, with the exception of the over-sentimental and illogical finale. Several set-pieces (the bar scene, the shoutout at the motel and the shots of Pasdar trying to make his way home) are unforgettable both in concept and execution. There was a persistent rumour that the original negatives of this movie were lost, but happily this proves to be just a rumour, and the image and sound quality on recent DVDs (including the Tangerine Dream soundtrack) are very good. The 2-disc R1 DVD contains a boring commentary by Bigelow, but also has a great cover and an excellent and lengthy recent documentary which reunites the cast, all of whom seem to have written their own sequels. Henriksen in particular reveals himself to be as eccentric as most of the characters he’s played. The documentary on the DVD also reveals that female lead Jenny Wright has gone missing in recent years, but doesn’t refer to writer Eric Red, whose recent life also seems to have been as dramatic as his screenplays. 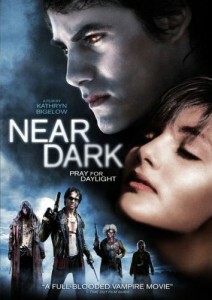 At the time of release, Near Dark was lost somewhat in the shadow of the cosier Lost Boys, but has deservedly regained its reputation as one of the classic vampire movies, and has gained new viewers since Bigelow’s Oscar triumph with The Hurt Locker. As Bill says in the infamous bar scene, it’s finger-lickin’ good. This entry was posted in DVD Review, Movies and tagged Lost Classics. Bookmark the permalink.